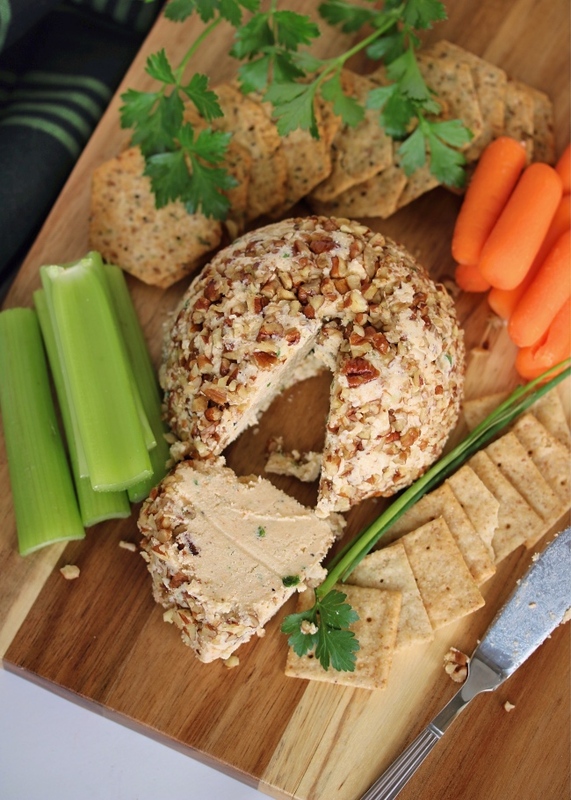 This dairy free cheese ball is made with cashews for a Paleo, Whole30 compliant, and Keto-friendly appetizer that everyone will love. Looking for a vegan recipe? I've got you covered there too- just one easy swap and this is animal product free. One of my favorite things on this planet is food. Well, duh- you guys know that by now. But truly- I love to talk about it, learn about it, gather around it, make it healthy & delicious, and of course eat it. One thing I've loved getting to know about my husband and his family over the years we've been together is what foods he grew up on. What was his favorite family dinner? Which brother was picky & wouldn't eat his veggies? What was on their Thanksgiving table? Really though, food is nostalgic- so I love taking dishes his mom would make and putting my spin on them, keeping traditions going, and watching & learning. 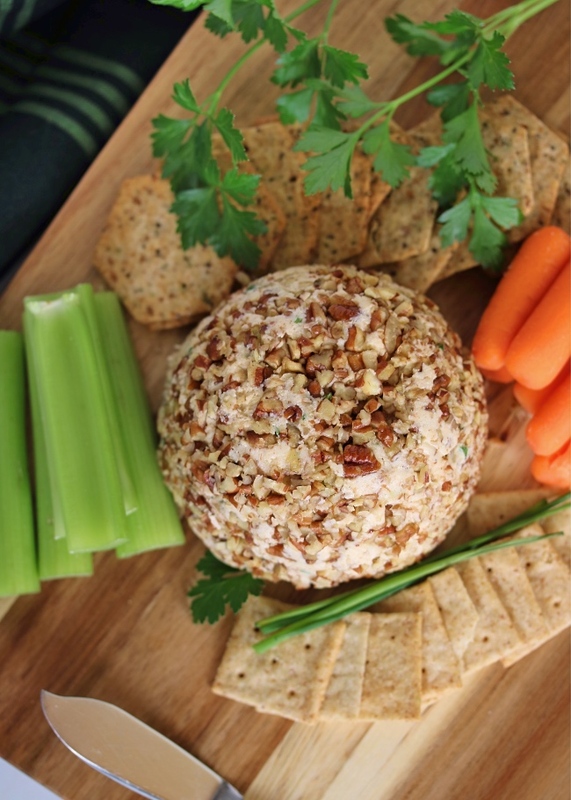 This cheese ball is one of those things my mother-in-law makes and brings to family gatherings, especially around the holidays, that everyone loves. Her version is different than this (not dairy-free), and absolutely delicious. But it's been on my to-do list to create a version that's allergen-friendly for those who don't do dairy- because everyone needs this in their life! It's the best appetizer to take to any gathering, and is going to be perfect for some light snacking before our big Thanksgiving feast. Make it the center of your charcuterie board, with deli cuts, nuts, sliced veggies, and crackers (we love Simple Mills for a grain-free find). Or keep it simple with just "cheese & crackers" on a cute plate. Not having a big gathering for the holiday? No worries. This keeps well, can even be frozen, and is super versatile if you'll be eating it on your own. See my "notes" below for some ideas, but in short: game day app, lunchtime spread on a wrap, Paleo lasagna night- there are so many uses for this delicious dairy-free "cheese"! I hope you enjoy it as much as we do! It was polished off FAST the same day I made it with only a couple of guests- so maybe make two if you're feeding a big crowd! Add the cashews, ghee, minced garlic, apple cider vinegar, and lemon zest & juice to a food processor. Pulse until the mixture is super smooth- scraping down the sides a few times as needed. Transfer the cashew cheese to a bowl and add the chives and spices. Stir until well mixed, and give it a taste. Add more spices to your liking, especially salt & pepper. 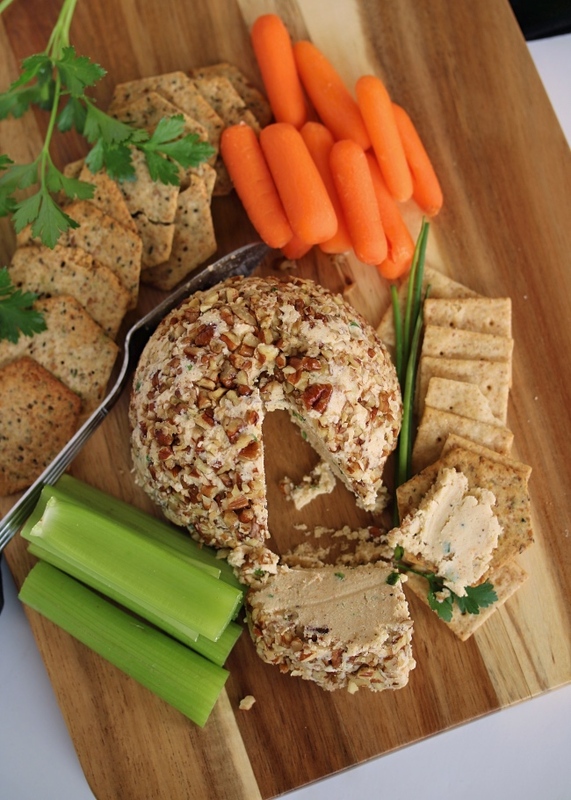 Once the cheese ball is firm, add the chopped pecans to a plate or shallow bowl. Roll the cheese ball into the pecans, pressing them into the outside. 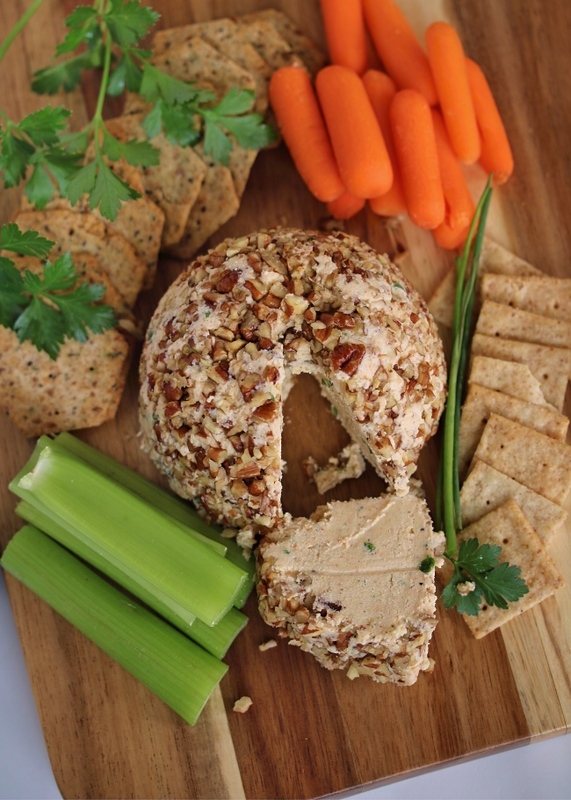 Place the cheese ball back into the bowl and store in the refrigerator until you're ready to serve. 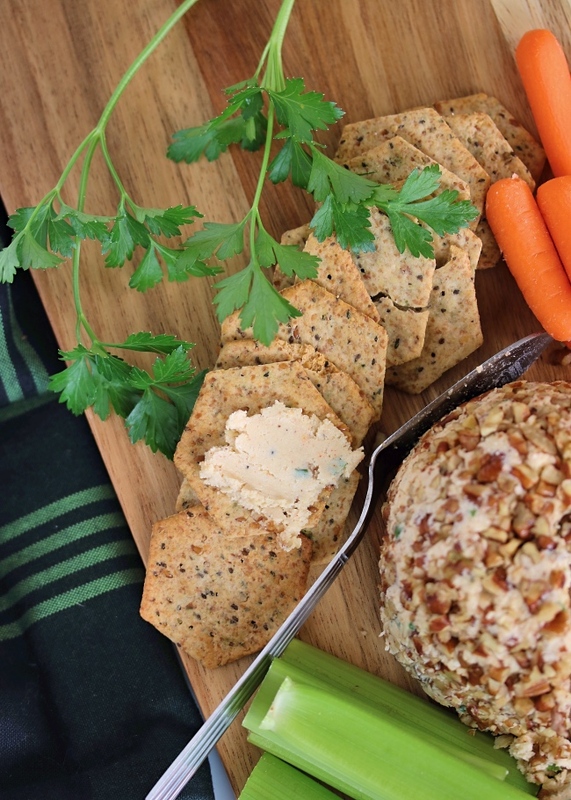 Serve chilled with grain free crackers or sliced veggies. To make this vegan, or just to skip the clarified butter if you're not a fan, you can substitute coconut oil for the ghee. Regular butter will work too. This lasts for up to 1 week, stored in the refrigerator. You can also store it in the freezer, just thaw it slightly in the fridge before serving. 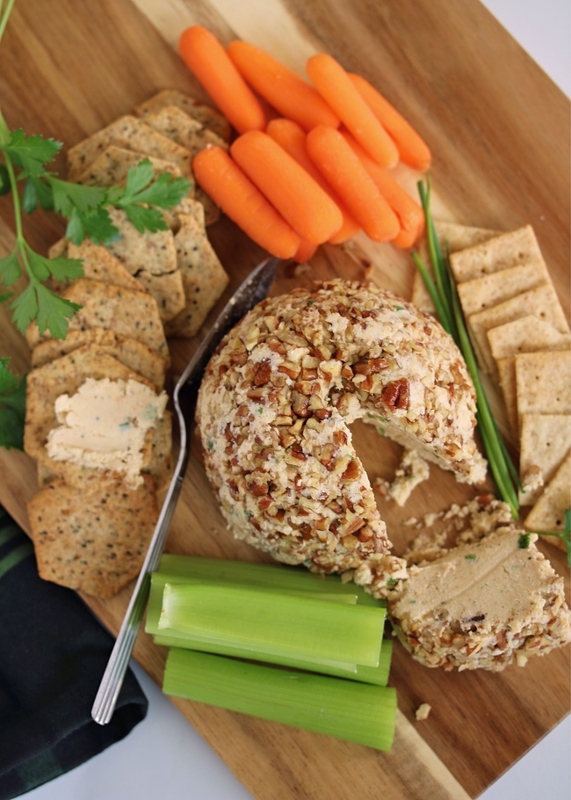 While we love this as a dip, it's also amazing as a spread! Try it on a lettuce wrap or grain-free tortilla, in a Paleo-friendly lasagna in place of the ricotta cheese, or spread onto a grain-free biscuit. Enjoy!